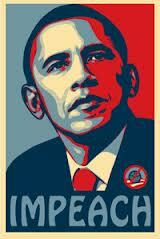 There's a contingency of Republicans in the U.S. House of Representatives which seeks to impeach President Obama. I hope they succeed. Not because I am anti-Obama or sympathize with them on any conceivable level, but because such an action, if successful, would sound the death knell for the GOP. With an embarrassingly low approval rating hovering in the mid single-digits, and with the party's overall image, brand and relevance in crisis mode, Republicans would seal their long-term obsolescence with such a self-serving, venomous partisan witch hunt while surely boosting Obama's political standing and currency (read: Bill Clinton). Impeachment proceedings, legislated as punishment for cases involving High Crimes and Misdemeanors not as debilitating, resource-draining ideological retribution, would unequivocally prove to voters that the GOP's been hijacked by a paralyzed cabal of enraged, sore-losing malcontents whose unprecedented hostility towards the president is a brain-cell-eating disease that's rendered them rationally and intellectually impotent on the major issues confronting the nation such as the economy, employment, immigration, education and the environment. As former Speaker Newt Gingrich can attest, Republicans would likely spend the next ten to twenty years or more (as these self-proclaimed "revolutionaries" did after Clinton's impeachment) in the political doghouse, watching enviously and regrettably as Democrats build another secular bull-run. But fortunately for these rabid impeachment-chasers, including Sen. Tom Coburn (OK), Sen. James Inhofe (OK), Rep. Kerry Bentivolio (MI), Rep. Jason Chaffetz (UT) and Sen. Ted Cruz (TX), articles of impeachment, if drafted, would likely never make it through the House, and even if it did, would surely be killed in the Senate. To be sure, one could argue that, given their unyielding political strategy of polarization and obstructionism, the real treasonous behavior is that which has been perpetrated daily since January 2009 by House and Senate Republicans, who at any and all cost to America, have put party before country as they seek to thwart Obama's agenda and ultimately bring down his presidency. Thank you for this post. I totally agree with you Andy. Go for it GOP! What makes you think that the House wouldn't vote to impeach PBO? They have had to votes to inflict tons of damage on the issues folks care about. I can see them voting to impeach PBO. It would do me so much pleasure to watch the teabagging repubs implode. I must say that I won't believe until I see it. I have waited 30+ years for this to happen. So many folks going back to Reagan have been sucked in by these bastards. Here's a new slogan: IMPEACH the LEMON ! John McCain is a Liberal?